Q: What is the best thing about working at Saiei? The best thing about working at Saiei is that you get to meet a lot of different people. The customers and students can be just as varied as the staff. It has to be the students. It’s so much fun to discover the new and creative ways they will try to learn the language you are teaching them. Q: What quality do you think is the most important for working at Saiei? The best thing about working at Saiei is, TEAMWORK. When people work together in an atmosphere of trust and accountability toward a common goal, they put aside turf issues and politics and focus on the tasks to be done. I’ve learned that people enjoy working together and teamwork satisfies a need for socialization. It helps people grow as they learn from each other and develop important skills. But most of all, working together toward a common goal provides a sense of purpose that is motivating and fulfilling. It’s the greatest thing you can have amongst your co-workers and for a company. Since we always have to strive to improve our teaching skills, one should be more receptive to change with a flexible attitude. A sense of humor is crucial. Sometimes, things will happen (difficult students, classes, scheduling difficulties, etc) and you have to be able to laugh through it. Things always look better when you have a smile on your face. Q: What is the most challenging part of this job? The most challenging part of this job is remaining patient when things pop up or don’t work as planned in class. The most difficult thing is to get the students to listen to you. Most of the students will probably do what you tell them to most of the time. However, there will always be times when some of them don’t. The better you get as a teacher the easier it will be to get the students to do what you tell them to. Being able to read students’ reactions and body language to keep their attention while teaching an interesting class that involves every single student. Q: Why did you choose to teach English in Japan? I studied Japanese and various aspects of Japan during my time at university, and after graduation I studied further at a Japanese language school in Tokyo. 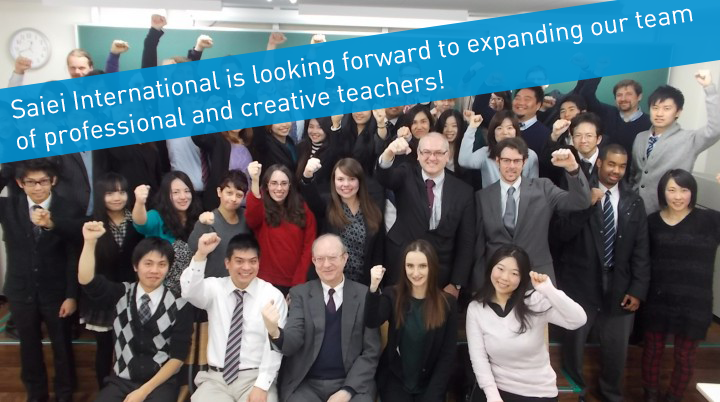 Before coming to Japan, I had wanted to join the JET program, and so at the end of my time at language school, I decided to pursue English teaching once again. My history in Japan started while I was a student in art school in Chicago. My teacher sent me to Japan to study ceramics in Tochigi. This trip had a profound impact on my life. Years passed, and multiple visits later I decided to try living in Japan. I landed in Saitama. I had experience teaching art, but no experience teaching English. 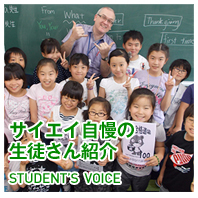 Not being able to speak Japanese working at an English school seemed to be the best option. I also wanted to work for a company that was large enough to give me the security to start my new life in a new country. Saiei International is and was the best option to satisfy my goals. I have always wanted to live in Japan and I used to teach English as a hobby in Canada. I thought that combining my hobby with my dream would work well for me. To apply or make inquiry online, click here.